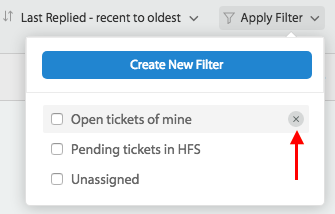 HappyFox provides a powerful Filter to refine your search in ticket list view. 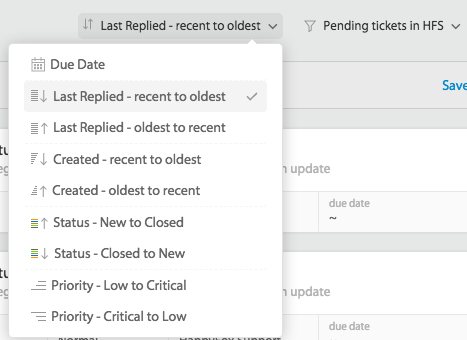 Filter conditions are retained even when the agent navigates to another queue/status/category and can be saved for future use. To create and apply a filter, the agent needs to follow the steps outlined below. 1. Click on Apply Filter -> Create New Filter. 2. Select the Match type. Match all – All aspects of the Rule must be satisfied in order to take the action(s). Match any – Only one aspect of the Rule must be satisfied in order to take the action(s). 3. Click on + to add a condition. The Add Condition list allows the agent to search for the tickets depending on the ticket property, custom field and time-based conditions. Learn about how Ticket Filter Conditions work here. 4. The result of the search conditions will immediately be reflected in the ticket list page. This filter/search query can be saved for future use by clicking Save option. This is helpful if an agent uses a particular custom search often to pull certain tickets. 5. The flexibility of Filter allows users to combine multipart filter and/or saved filter(s), to view the right set of tickets to act on. 6. By default, the search results are sorted from recent to old. This can be changed according to user preference by choosing the appropriate option from the drop-down. 7. The saved searches can be deleted by clicking the cross mark (X).